There are times when I want to save the audio stream of a video file as a MP3 file. I tried using Sound Converter for this, but it would fail while trying to install plugins. But using FFMPEG worked fine! MP3Tag is a popular and useful MP3 tag editor on Windows. I was looking for an alternative to MP3Tag on Ubuntu and discovered PuddleTag. PuddleTag tries to be a drop-in replacement for MP3Tag and it gets the job done. It can be used to edit tags and filenames of MP3 and FLAC files. Foobar2000 is not just a good audio player, it can be used to convert audio files to any other file format, like MP3. To convert to MP3, Foobar2000 needs the LAME MP3 Encoder. LAME ships only as source code. Compiling the source code on Windows can be quite a chore. Thankfully, pre-built LAME bundles can be downloaded from RareWares. The bundle ships as a ZIP file that includes the LAME executable (lame.exe) and library (lame_enc.dll). Foobar2000 uses the LAME executable for MP3 conversion. Unzip the LAME bundle in a suitable location. Open Foobar2000 and load the audio files that need to be converted to MP3. Select the files to convert in the playlist, right-click and choose Convert → Convert. 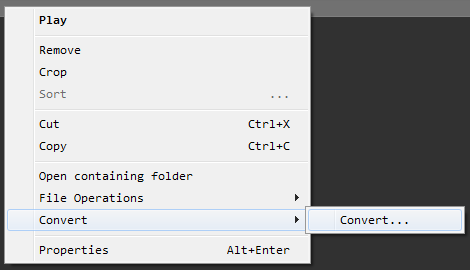 In the Convert dialog, click on Output Format and choose MP3 (LAME). To set the MP3 bitrate, click Edit. Click Destination to set the filename format and the destination directory. Click Convert to begin the conversion. The first time you do this, Foobar2000 pops up a File dialog to allow you to choose the location where the LAME executable is located. After this, the files are converted to MP3 and written to the destination directory. The MP3 conversion should be pretty fast since Foobar2000 spawns off one LAME encoder instance per processor core of your computer. A lot of people like this feature, since it automatically downloads album art and creates overlays on media folder icons to look like CD covers. However, I hate Windows or anyone messing with my media files and directories. But thankfully, this irritant can be handled. 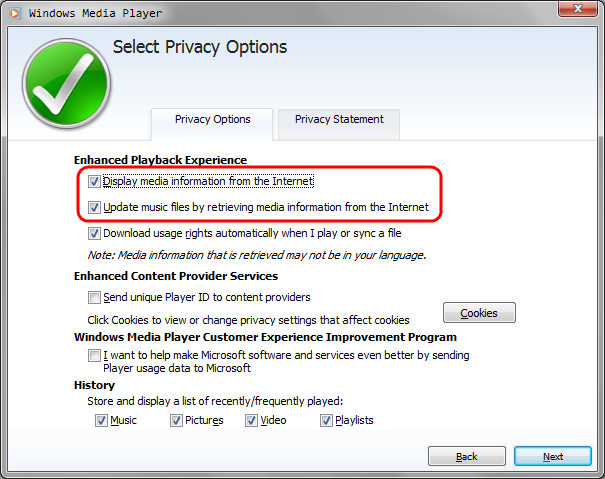 This automatic update option can be disabled the first time a user invokes Windows Media Player. At first invocation, WMP throws up a setup wizard to configure the options for the software. 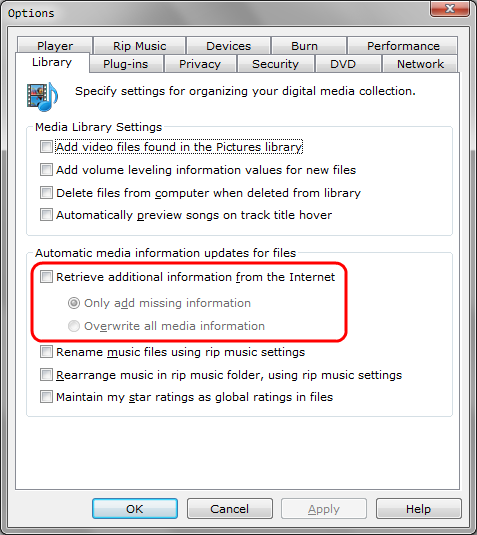 Disable the option Update music files by retrieving media information from the Internet. To disable these updates from inside Windows Media Player, choose Organize → Options. Disable the option Retrieve additional information from the Internet. Use a search tool like Search Everything to search, find and delete the offending album art files.